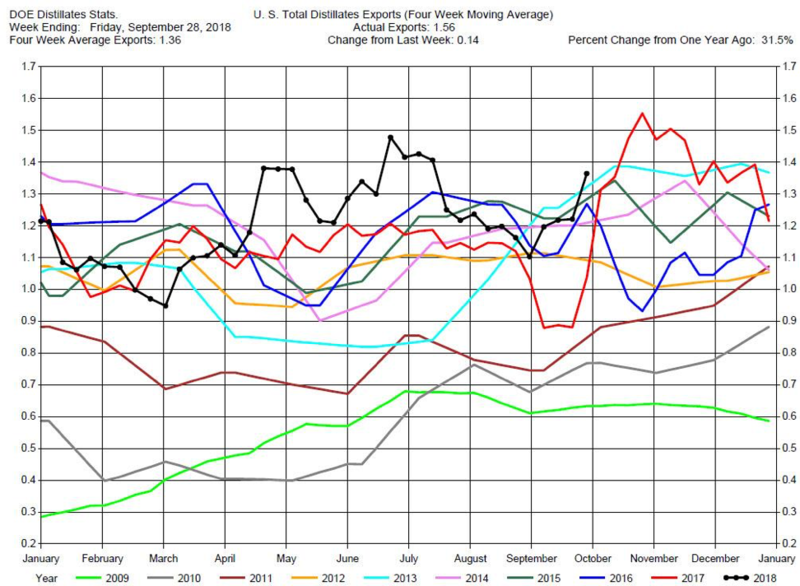 The DOE reported Total Crude Oil Inventories increased by 8.0 million barrels to 404.0 million barrels for the week ending September 28, 2018, while expectations average was for a 1.5 million barrel increase. The range of expectations was from a 2.5 million barrel draw to a 3.4 million barrel build. 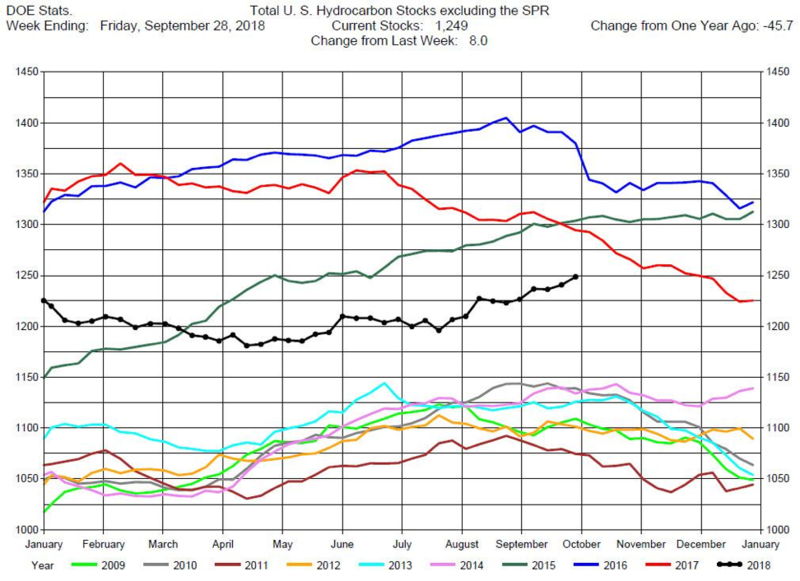 Overall hydrocarbon supplies increased by 8.0 million barrels to 1,249 million barrels. 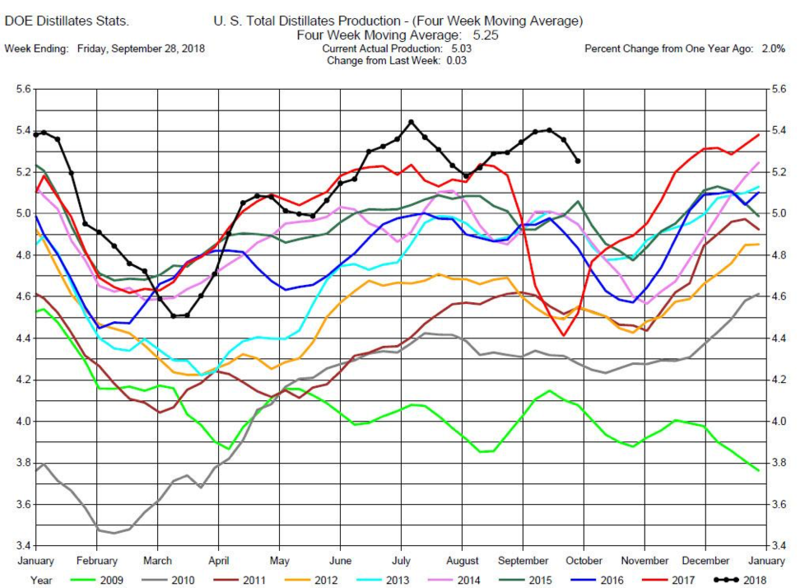 Crude Oil Production was unchanged at 11.1 million barrels per day. 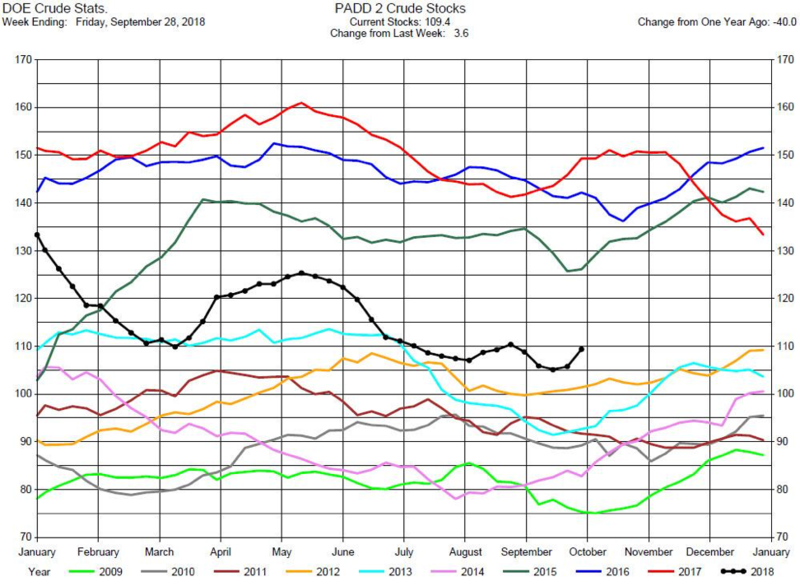 Total Crude Imports were up by 200,000 barrels per day to 8.0 million barrels per day. 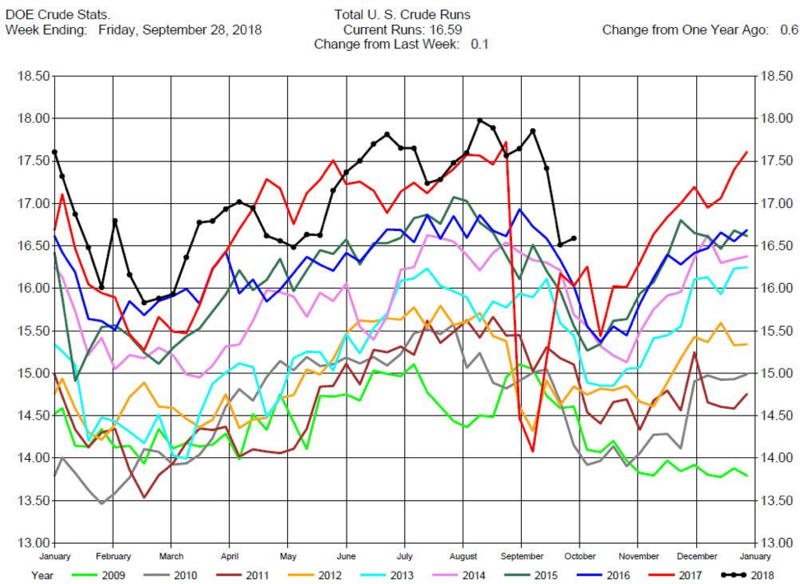 Total Refinery Crude Runs were up 100,000 barrels per day to 16.59 million barrels per day. This report was bearish for crude oil prices and prices dropped with the release of the report. But then prices rallied and ended the trading day up $1.15. 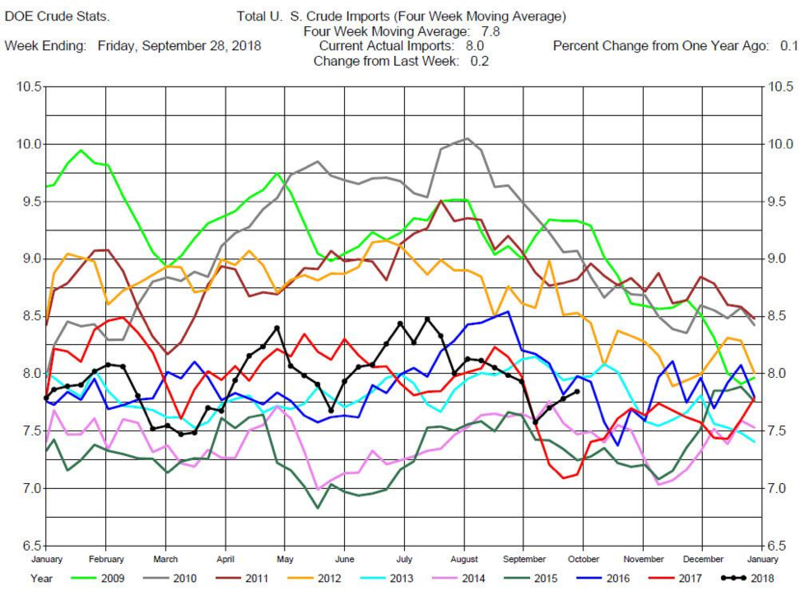 So it appears that traders are more concerned about potential crude oil world supply shortages than the bearish crude report. With traders bullish sentiment prices have broken out of the previous trading range. We now recommend consideration of long positions in outright prices or crude calendar spreads. 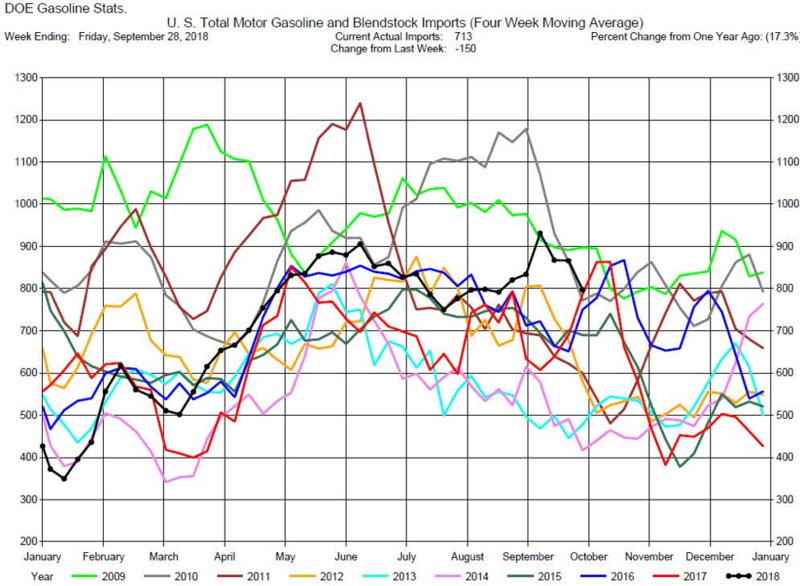 Gasoline Stocks Draw, Expectations were for a Build. 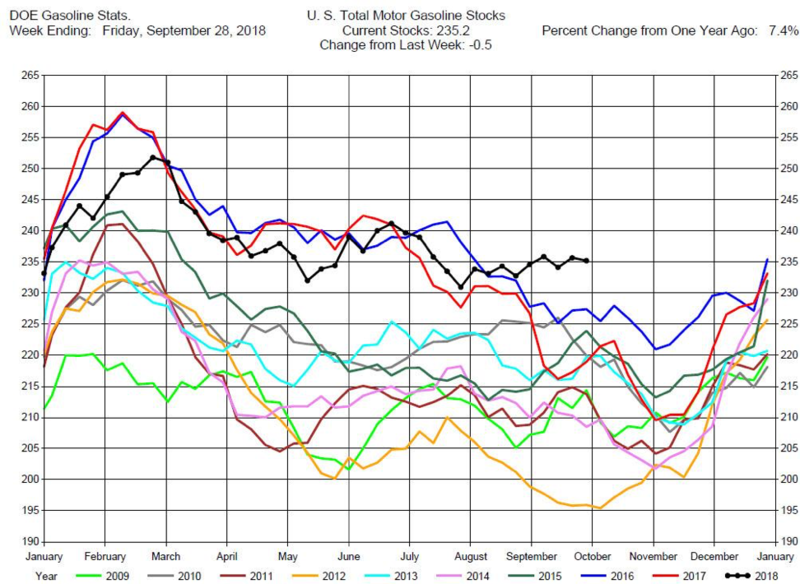 Total MotorGasoline Inventories decreased by 500,000 barrels to 235.2 million barrels for the week ending September 28, 2018, while expectations average was for a 1.0 million barrel increase. The range of expectations was from a 2.0 million barrel draw to a 2.4 million barrel build. 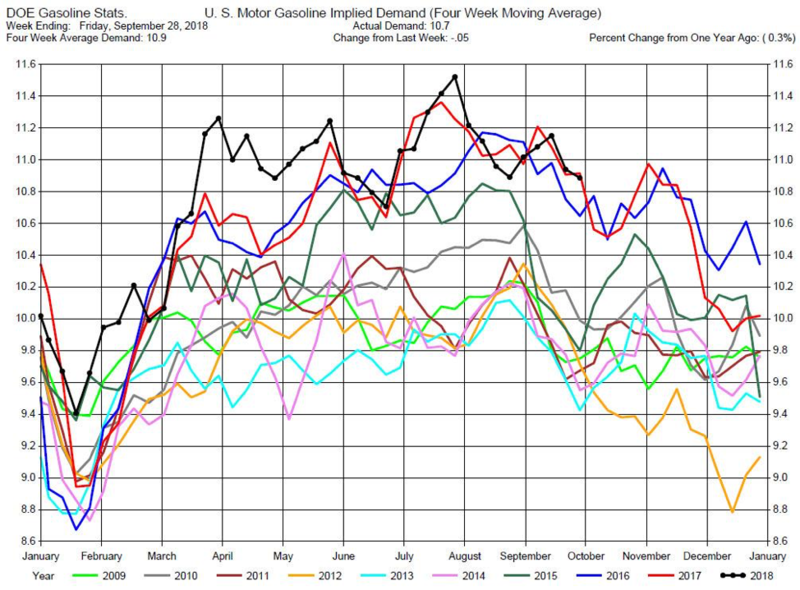 Implied Demand was off by 50,000 barrels per day to 10.7 million barrels per day. 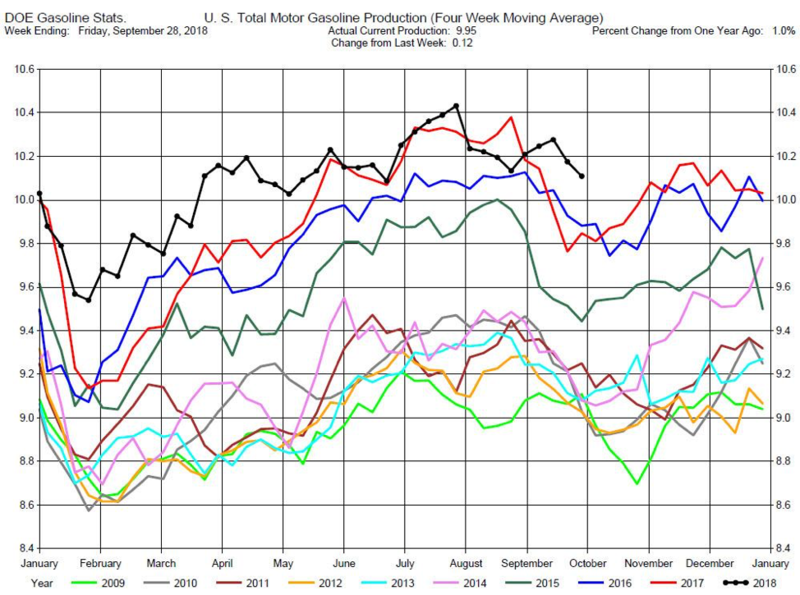 Gasoline Production was up by 120,000 barrels per day to 9.95 million barrels per day. 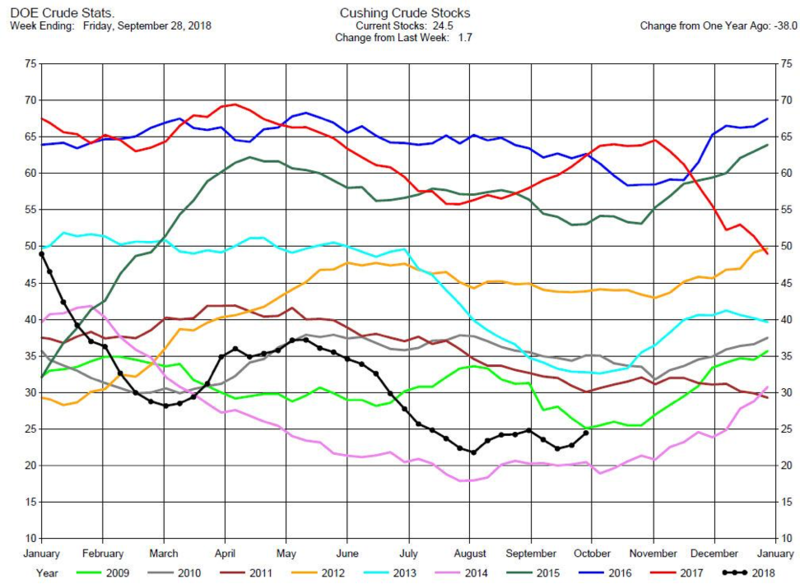 Gasoline prices have tracked crude oil prices with cracks increasing. 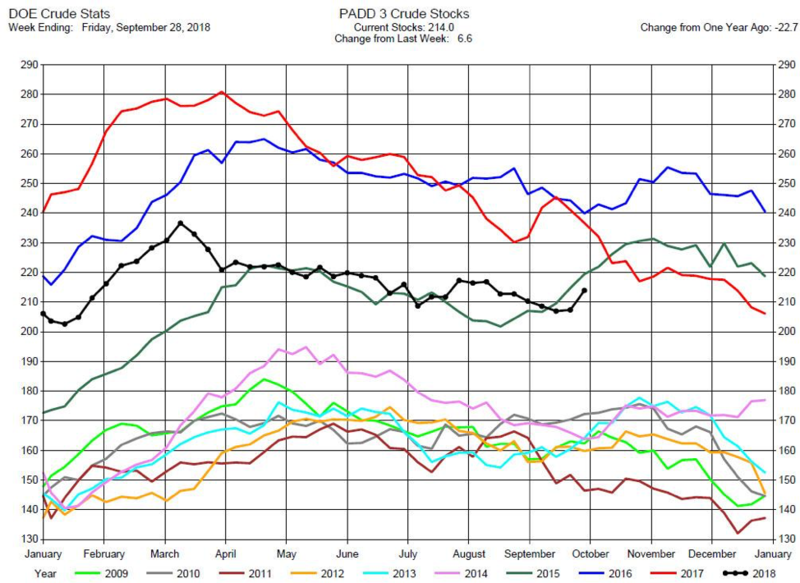 We still suggest considering long positions in the out month cracks such as the November or December gasoline cracks. 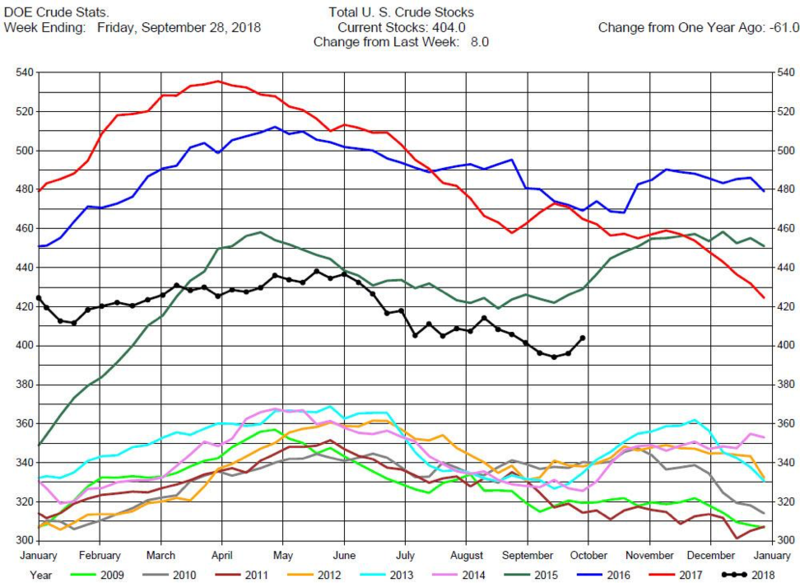 Total Distillates Stocks decreased by 1.8 million barrels to 136.1 million barrels for the week ending September 28, 2018, while expectations average was for a 1..5 million barrel draw. The range of expectations was from a 2.5 million barrel draw to a 1.2 million barrel build. 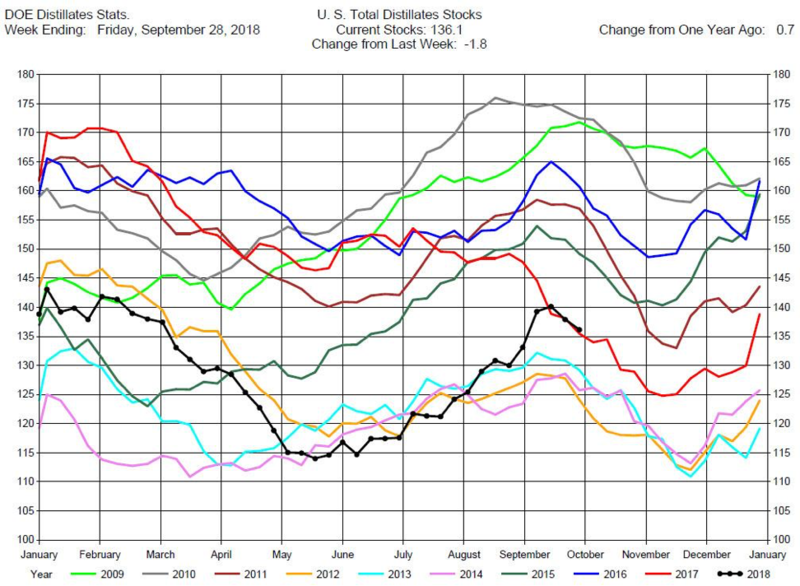 Total Distillates Production was down 30,000 barrels per day to 5.03 million barrels per day. 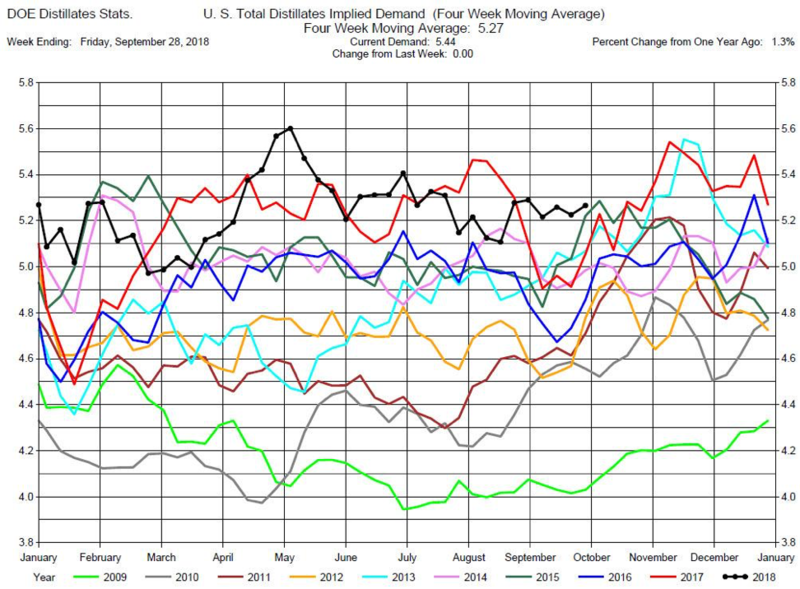 Total Distillates Implied Demand was unchanged at 5.44 million barrels per day.